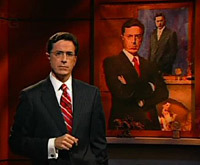 Old news, but fun to remember where the Colbert Report started. "Truthiness." Stephen Colbert of Comedy Central's Colbert Report popularized the word "truthiness," and it has been selected by the American Dialect Society as the "2005 Word of the Year." But all this begs the question: What does "truthiness" mean? And who or what is the American Dialect Society?